IBB: Tell us a little about yourself. 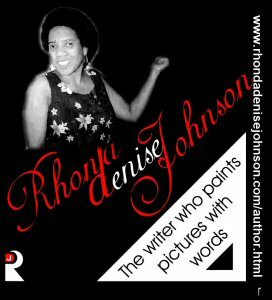 RDJ: Rhonda Denise Johnson is the writer who paints pictures with words. IBB: What made you decide that you wanted to publish your writing? RDJ: I started sharing my writing in junior high school when the English teacher would give us writing prompts and have us read what we wrote to the class. It has just always felt good to create beautiful things that make other people feel good and writing is one of those beautiful things that I do. 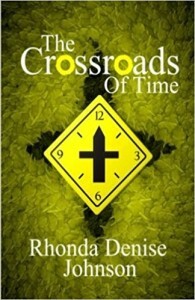 IBB: The Crossroads of Time is your debut fiction release. How much of it is auto-biographical? RDJ: The main character’s angst is kinda autobiographical. Like Cloe, for many years I tried to do the common sense thing and get a teaching credential that would lead to a ‘real” job. But every time I read a book I’d feel like this is what I need to be doing. I was forty years old before I threw other people’s expectations to the wind and embarked on what I really love. Cal State Los Angeles is my alma mater, so the setting in this novel is authentic. IBB: You’ve got as many words as you need; tempt a reader to try it out. RDJ: Want to curl up with a flaming read? Click here to get your copy of Fire Master. IBB: Were there any particular parts of the writing/publishing process that you struggled with? RDJ: I’m fortunate to write at a time when indie publishing is coming into its own as an industry with standards and resources to help writers give their best to the reading public. The so-called gatekeepers and Hollywood style sharks (“I’m going to make you a star, baby.”) are still out there, but that’s true for traditionally published writers as well. IBB: How did you create such enticing cover art? RDJ: I have a friend who’s a professional graphics artist. I give him a basic idea of what I want, maybe suggest what images to include, and he performs his magic. IBB: Where do you like to write? IBB: Is there anything you must have in order to write? RDJ: I’ve come to recognize that as a procrastination game my mind tries to play. I can’t do this until I have that, and of course, I can’t have that until I do this. I’ve learned to work with what I’ve got. That’s part of the discipline of the writing craft. IBB: What books have influenced you most, both as a person and as an author? RDJ: I’ve read thousands of books, so it’s hard to think back decades to the one or two books that influenced me so long ago. The earliest memory that stands out is Pippi Longstocking. I’d go right to her when the bookmobile stopped at my elementary school. These days, I enjoy the works of Carl Sagan, Douglas Adams, William Golding, Isaac Asimov, Maya Angelou, J. California Cooper. IBB: What is the one thing that has helped you develop most as an author? RDJ: The recognition that writing is a craft. In the third draft of my current project, I came upon an entire chapter that wasn’t working. There was nothing wrong with the chapter. It was a masterpiece of brilliant writing, but it just didn’t fit into the arc of my story. It had to go. I had to get mean and ugly. This isn’t my baby. This is a book and all that matters is the final product that I give to my readers. Writing is a highly emotional endeavor. After I’ve put my heart into it, rearranging and cutting requires the ability to look at it objectively, so after expression comes craft. IBB: What do you want to achieve most from your writing? RDJ: I have a vision of college graduate students reading my work and having vehement discussions about what I meant by this and that. In my more fanciful visions in a thousand years, people will still be reading me like we read Beowulf today. IBB: Is there something specific you do to improve your writing? RDJ: I make sure my characters are acting in a way that is natural to them. There’s something divine about creating a world and populating it with characters. I use the James Frey step shoot and the K.M. Weiland three act structure. So I pretty much know the end from the beginning. But then I look at the people I’ve created and they’re all atheists. They don’t care what I want them to do. They want to do what they want to do. They thumb there noses at me—at me—and that’s how I know I’ve created real people that my readers can relate to. IBB: If you had a direct line to someone who loves or hates your writing, what would you say? RDJ: What is it that you love? Why do you keep reading it even though you hate it? IBB: If you could give one piece of advice to an aspiring author, what would it be? RDJ: The most important two questions a writer can ask: what if? And why not? IBB: How often do you read? What genre? RDJ: I read every night. Right now I’m reading detective/mystery series such as Harry Bosch and Alex Cross. But also like fantasy and paranormal. IBB: Thanks for taking the time to answer our questions. Best of luck in the future.